The coaxial coarse/fine focus knob, located in front of and close to the operator, makes operation at high magnifications more efficient and convenient than ever before. The stage features a low-profile design that is 195 mm high, making it the ideal size for a lab bench or safety hood. Even cell cultures on the bottom of a tall flask or stacking chamber vessel can be viewed, because there is 190 mm of space above the stage when the condenser is removed. Two types of acrylic stage rings come with the main body. Because these stage rings are transparent, confirming which objective is being used is easy. The ring with the semicircular hole facilitates observation of the specimen in a chamber since it prevents the objective lens from striking the ring during magnification changes. A glass stage ring that minimizes the possibility of thermal deformation is also available as an option. The quintuple (5-position) backward-facing nosepiece offers plenty of clearance to allow the operator to rotate it from either side. Because there is ample space around the nosepiece, handling the nosepiece is easy, even for an operator with large or gloved hands. The Siedentopf-type eyepiece tube is inclined 45° and the eyepoint height is 400 mm for easy, comfortable viewing in the sitting or standing position. 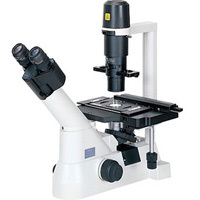 Featuring a 22-mm field of view, the widest in this class of microscope, the TS100 and TS100-F ensure clear images up to the periphery of the field of view even when using higher magnification objectives.